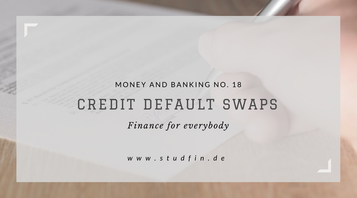 18. Credit Default Swaps - Studfin - Einfache Geldanlage! You think credit default swaps are none of your business? I promise that they do affect you at least indirectly. I have written an easy explanation what they are and why they triggered the financial crisis in 2008! Credit derivatives like credit default swaps are comparable to an insurance that protects you from the risk of credit default (the risk that a credit that cannot be paid back). A corporate bond can be split up into three parts and therefore between three parties. One party could supply the money to buy the bond. If the interest rate is calculated "correctly" it should compensate the buyer of the bond for carrying the risk of credit default and the interest rate risk. The interest rate risk is the risk that higher interest rates are available in the future for the same level of risk. As a consequence the bond would not be as attractive anymore. Hence, the value of the bond would decrease. Which bond would you rather buy? The bond company xyz with an interest rate of 5% or the same bond with an interest rate risk of 10%? You would only buy the bond with the 5% interest rate, if it were much cheaper than the 10% bond, right? 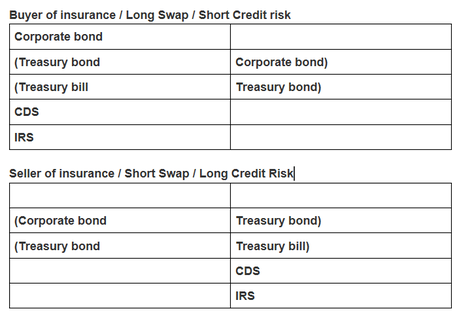 So, the party that buys the bond sells these two risks. The second party buys the risk of default and the third party buys the interest rate risk. The second and third party gets compensated for carrying these risks. Now the first party has stripped away the risks and is left with a "risk-free security" comparable to a treasury bill. The process of selling the credit default risk is called a credit default swap (CDS) or collateralized debt obligation (CDO). With a credit derivative, you can hedge yourself against the risk of a defaulting credit. That is the reason why it is comparable to buying an insurance. How does this insurance against default work over the lifetime of the contract? If you buy a corporate bond you lend money to a company. The company promises to make regular payments and to pay back the borrowed amount in x years. You are afraid that the company might not be able to pay back your money in x years so you enter a CDS contract. The probability that a company is in paying back its credits is rated by an agency like Moody or Standard & Poor’s. A company can have a very good ranking like AAA or a bad one like CC. The first party has to pay a certain amount (which is called risk premium) to his CDS counterparty, like the risk premium you pay your health insurance. In return, your counterparty promises to pay you the amount of the bond if the company defaults. When the corporate bond does not default you just pay the yearly risk premiums and the second party does not pay anything. If the corporate bond defaults your insurer/the second party has to pay the value of the bond to you. Why can these swaps be dangerous for the economy as a whole? Firstly they happen off balance sheets most of the time, which makes it hard to spot them and secondly the insurer does not need to have collateral or equity to back them up, which can be dangerous if the company defaults and the insures has to make a big payment. That was one the reasons for the financial crisis in 2008. Too many “insurer” insured mortgage-backed securities and could not meet its payments because too many mortgages defaulted. Unfortunately, they did not have enough equity to pay back the defaulted bonds. The insurers are often dealers, who buy many CDS to get a diversified portfolio and minimize risk. If everything is priced correctly the dealers should not make huge profits or losses, because the credit risk of a company should compensate the credit holder accurately. Therefore the coupon payment is big enough to cover the risk of a defaulting company, if they held a diversified portfolio. Before the crisis loans were given away for an interest rate that did not cover the risk properly. What happened during the financial crisis? Companies thought they could make an arbitrage (Earning a risk-free profit). That is the reason why they were giving away so many credits and mortgage-backed securities (MBS). They would charge their clients 10% for their loan and were buying default and interest rate risk insurances for 8%, so they made a 2% "risk-free profit". Due to the fact that they thought they found a wonderful arbitrage opportunity they gave away way too many credits, without proper security checks and interest rates that were too low. As soon as credits started to default the dealers or insurer could not pay back the huge amounts of these failing credits, because they were not holding enough securities or capital to back them up. Consequently, they could not pay back the banks, the banks were losing money and the downward spiral began. Explanation of the Financial Times Quote: An example of the financial crisis was the AIG and Goldman Sachs example: GS gave away way too many credits and bought CDS from AIG. AIG thought that these credits were basically risk-free because AIG was well diversified and mortgages were usually paid back, because they are backed up by houses that people want to keep. So AIG thought that these credits were priced correctly and they do not need to hold collateral or equity against them. As soon as more and more mortgages started to default AIG had to make repayments to GS. Good thing that GS was the bank of AIG so the money was already at GS, but AIG went bankrupt pretty quickly. From the money point of view you have to think in balance sheets. How would this transaction look like in balance sheets? If you are new to the balance sheet approach look at my older blog post. Imagine the buyer of the insurances has a corporate bond but would rather change it into something comparable to a treasury bill. Therefore he sells his default and interest rate risks. He gets rid off his credit risk by doing a credit default swap. Furthermore, he gets rid of the interest rate risk by selling this Treasury bond and buys a treasury bill (A treasury bill or tbill is a bond issued by the government). Now he does not have to worry about changes in the interest rate because he did an interest rate swap. As a result, he is left with a risk-free asset that should not pay more interest than a normal treasury bill. The second party bought the risk of the corporate bond and now has to pay a certain amount (which is called risk premium) to his CDS counterparty. In return, your counterparty promises to pay you the amount of the bond if the company defaults. When the corporate bond does not default you just pay the yearly risk premiums and the second party does not pay anything. If the corporate bond defaults the second party has to pay the value of the bond to you.